Registration after August 8th is $120 and must be arranged directly with Levi (920) 493-0355. • Minimum 4, maximum 6 players on the court with minimum 2 females on the court at all times. 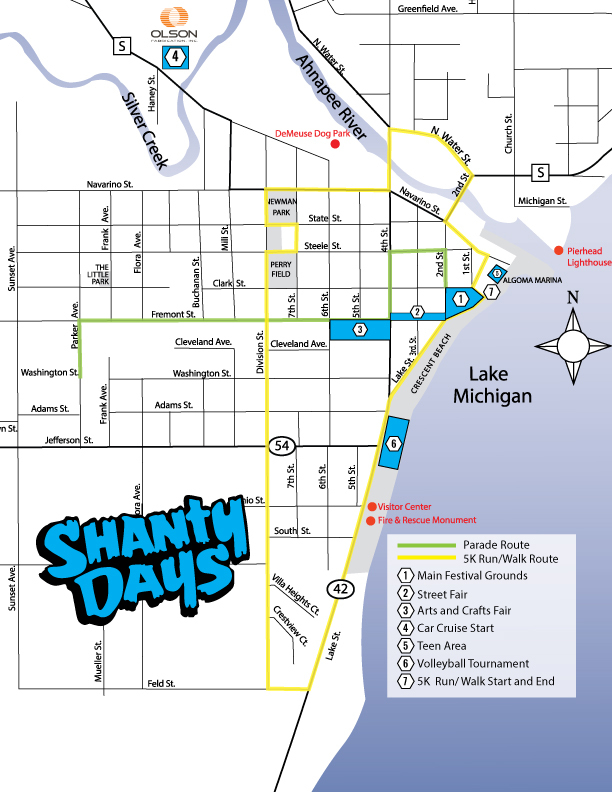 PLEASE TAKE ADVANTAGE OF UTILIZING YOUR SHANTY DAYS WRISTBANDS AND ENJOY THE AMENITIES OF THE GROUNDS INCLUDING VARIOUS FOOD STANDS, MUSIC AND RESTROOMS ALL JUST A SHORT STROLL DOWN THE BOARDWALK. • A team can consist of up to 10 players. • This is a co-ed 6 player tournament. • You must have at least two females on the court at all times. • The team must have a Captain/Contact Person identified on the sign-up sheet. • All team members must be at least 18 years of age. • First 8 teams to turn in the entry fee and contact info will be in the tournament. No refund if your team does not show up, and your games will be forfeited. • A release of liability form must be signed by all players on your roster the day of the games. • Minimum of 4, maximum of 6 players on the court for each game. • At least two females on the court at all times. • Rotating substitution of additional players on your roster into the server position. • A person cannot play on two rosters. No additions to your roster after the start of your first game. • 3 touches maximum per side. A girl must touch if more than one touch occurs per side. • The poles are out of bounds, if the ball hits the pole it is a dead ball. • There are no antennas on the nets; therefore the entire net is playable. • If the net is touched at all during play, the ball is dead and goes to the other team. • If the ball hits the net during a serve, it is playable. • A representative from each team will be asked to be score keeper as needed when they are not playing. The Shanty Days Juniors Coastal Coed Beach Volleyball tournament will be held on Sunday, August 12, 2018, beginning at 12 noon on Crescent Beach in Algoma. This is a coed tournament for youth in and going into high school. There must be at least 3 people on a team with a maximum of 6. Four players will be allowed to be on the court at one time. There must be at least one female on the court at all times. Beach volleyball rules will be followed. Each participant is required to sign a release form. Parents must also sign the form for players under the age of 18. Click here to download the form. The cost is $30 per team. Visit our Facebook page for updated news and information. Message us on Facebook to sign up or if you have any questions.